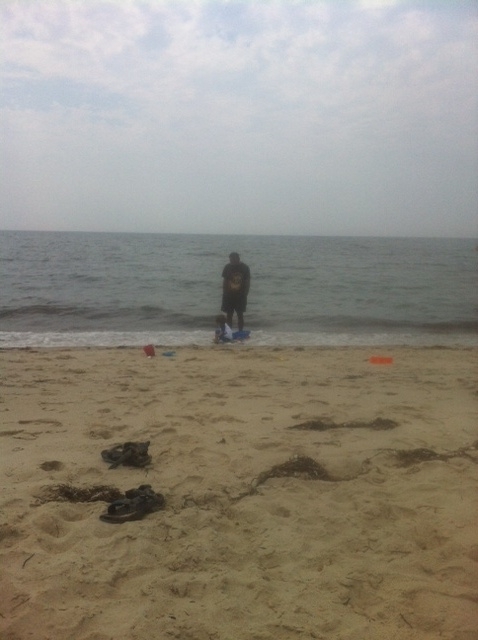 Two weeks ago, I went on a family vacation to Cape Cod. It was as relaxing as a trip with a toddler gets, which is to say, not at all! Before I left, I had hoped to be finished with the first draft of Witch Blood, book three in my Vampire in the City series. But my day job, which is usually really quiet in the summer, got extremely busy. So much so that I was much too tired in the evenings to put my mind to writing. But eventually time passed, and with it, so did my self-imposed deadline. But never mind–I was off on vacation…or so I thought. The stupid guilt of not making my deadline kept popping up in my head. Plus, driving to Cape Cod from New York City involves four to five hours of sitting in the car doing nothing, so I had plenty of time to think about how I had failed. The husband and son playing while I mentally yell at myself. The first few days I was there, I didn’t do any work. After all, I hadn’t intended to, right? On the third day, the sun got to me, and I ended up taking an afternoon nap with my son. That night, I couldn’t fall asleep, and thoughts of my book kept coming back to me. Finally, sick of beating myself up about it, I dragged out my laptop and started writing. Instantly, I felt much better. I’m not saying I made a huge dent in the remainder of the book, but I wrote about 1,000 words, felt better about myself, ate some fresh cherries from a farm stand, and promptly passed out. The next day I didn’t have a nap, but still managed to write a little, as I did every other day for the remainder of my trip. On the car ride home (which was an agonizing eight hours), I did a pretty complete job planning out the rest of the series. As a result of this, I came to the conclusion that I can never take a day off from writing. Now, this doesn’t mean that I need to sit down and write for five hours straight every night. But in order to keep my novel top-of-mind, I need to work on it a little bit each and every day, even if I only write a couple hundred words. After my first day back at work, I was so exhausted that I wrote about a hundred words and felt near collapse. Instead of beating myself up about it, I worked on some cover concepts for the next four books. Did I get my daily quota done? No. But I managed to do something productive, felt great at having accomplished something afterward, and got one small step closer to finishing! I enjoy reading this posts as much as I enjoy reading Donna Ansari’s books, and I’m so looking forward to the third one AND delighted at the thought there’ll be MORE than that in the future. So all I can say is, keep writing, and I’ll keep reading! I love your writing style, and the fact that the female lead doesn’t overload her system with hormones every other page and moan when she sees’ some guy. Just pure fun to read. I like what you write about yourself, also. You’ve got a pretty good sense of humor. I think I do too. The keyword being, THINK. You see I’m a lover of puns – the worse the better. My wife LOVES them when I do it, not really though I can hope. Love your stuff. Thanks Ron! I’m a secret lover of puns as well!